Zodiac Cadet 250 Compact R.I.B. 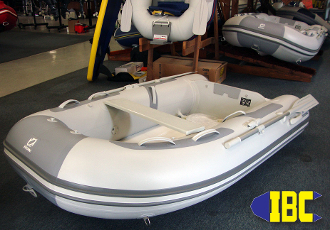 Our Products >> Zodiac Cadet 250 Compact R.I.B. Now you can have all the benefits of a Zodiac R.I.B. in a model that folds and stows in a bag about the size of an ironing board. That's right you read correctly, it stows flat and out of the way for those times when you don't need it or want it above decks or in the water. The perfect small tender/dinghy that is also well suited for the all around fish and camp family fun vessel. Slap an 8hp Yamaha on it and hold on as you jump onto plane and skip accross the water to destinations you dreamed of. New for 2017 the Zodiac Cadet 250 Compact RIB (rigid hull inflatable boat) is very unique in that it features a lightweight one-part fiberglass hull that allows the boat to fold down and be stored away in a nice tote bag. With all the genuine features of the Cadet model line and rigid structure, this is a great choice when portability and storage is a factor.